I went through a phase where I thought I should collect him, but if I keep collecting all these players I will never have the ones that matter most like Pujols, Cano, Lind, etc. I am looking to trade these for other autographs, preferably Cano but will entertain other offers. 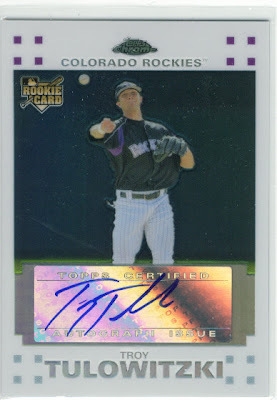 I may also streamline my other Tulo cards in order to get more of the guys I am really working on. So if you have anything that might interest me, please shout it out. 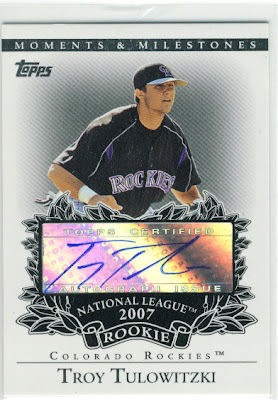 You may want to reach out to James Foote at Tulo Trader - he and I did a TON of trading a year ago. He hasn't had a lot of time to blog lately, but I would guess he's still a collector and may have something to swap you.